The plan is to make a whole pack of collage poems based on Tarot cards. 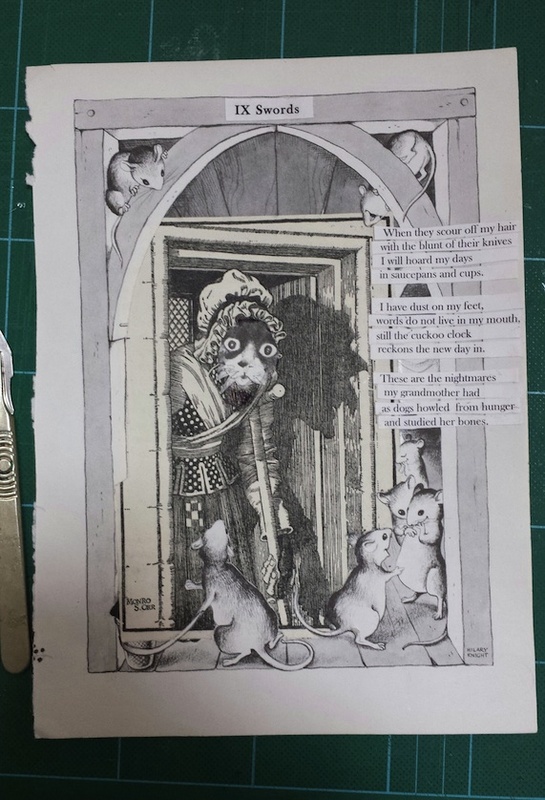 This is as far as I have got with the collage part, though I have written twelve poems. I thought it was time to bring the visual art and the poem writing aspects of my practice together and it will give me something to work on project-wise now Bluebeard is (hopefully!) roaming the bookshelves. The idea is still very much on the cutting mat as this picture demonstrates. The scalpel to the left is the one I bought when I began my Foundation Art and Design course when I was 19. I’ve changed the blade more than a few times of course, as needs must. Exhibition at Anteros . . .